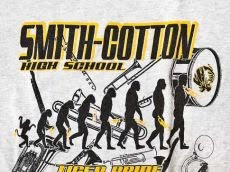 Some parents in Sedalia, Missouri, are upset at a band t-shirt designed to promote the Smith-Cotton High School marching band's show, "Brass Evolutions 2009." "School administrators overreacted to the pressure from some parents who obviously saw the image as promoting the theory of evolution and a threat to their own Christian beliefs." "We find nothing wrong with the T-shirts and believe the students should be able to continue wearing them if they choose to." It is easy to bash the superstitious, the irrational, and even, at times, the religious, and "learned" folks do it all the time. That the editor's last name is Satnan only adds to the fun. I, for one, want to thank the parents who objected. Do I think the parents were right? Nope. Do I think evolution is a lousy theory? Nope again. We did not evolve from monkeys! We share a common ancestor. That's a huge difference. That so few folks busy shoving the Constitution up the nostrils of their fundamentalist neighbors understand the theory of evolution themselves makes me want to pray for our country's future. The photo is from the Sedalia Democrat here. A thumbs up to BL Rag for picking up the story. I found this today as well. I too, thought about tossing it up on the blog. I'm glad you did. I decided to read your previous post with my time instead. This... this story is just too dumb for words. That image adorns a slide set I use in biology class as an example of an artistic interpretation that creates more misconceptions than, well- I don't know what. Protesting it? Blah. Even using it? Meh. What a goofy and terribly busy design. The fact that this happened about two hours south of here? Ugh. It's all just so... wrong. When we treat evolution as a belief, as much as our culture does, we get this kind of nonsense. It wouldn't be so bad if the nonsense was not passed off as "science"--no wonder biology gets a bad name in some zip codes. I am, too, a trumpet player--my son, alas, plays the bone. To be fair, the modern trumpet and the trombone both come from a common ancestor. Really. Doyle, I know. I was being cheeky (a la Dizzy Gillespie) as usual. We didn't come from monkeys? Are you serious? Next thing you know, you'll be talking about a heliocentric universe and telling me that I can't determine behavior based upon the bumps on one's head. Well, John, my behavior was definitely changed by the bump on my head when I was hit by a car...., but that's probably not what you meant :). Hey Doyle, my book is available right now. Hey, John, I just bought it!